» Y-TEAM - "Yeast Total Enhacement Advanced Method"
To guarantee its clientele, since 2007, EVER in collaboration with AQA (San Michele All 'Adige Institute), began the product certification for active oenological dry yeast calling it "High Vitality and Purity Yeast ", they reached the DTP 100 standard under the control of CSQA. 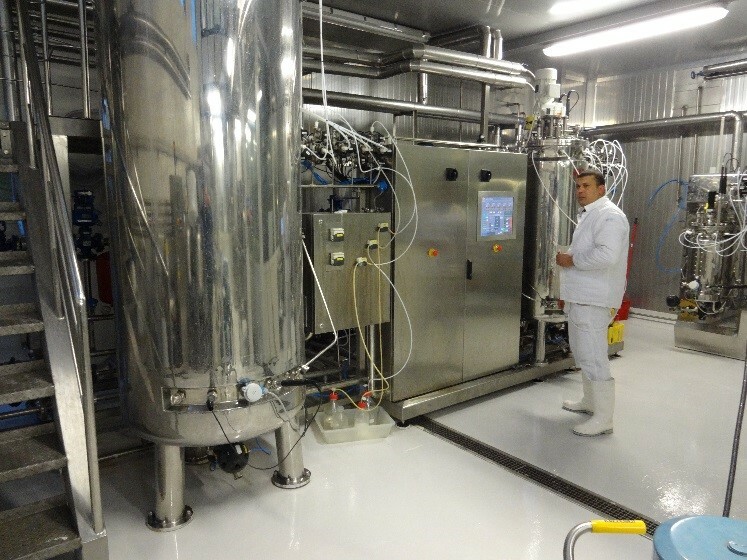 We’d realized early on that relying only on some chemical-physical or microbiological characteristics did not fully guarantee the customer because it is focused only on the final part of the production process. From this observation the need for a "global" approach arose that includes all the phases of the process starting from the selection of the strains, through the genomic characterization and sequencing, the upkeep of the collection, the management of the multiplication of the LSA, the qualitative control, the correct packaging and storage, up to the distribution and application of the appropriate rehydration procedure. All this is achieved through the exclusive Y-TEAM method: presented for the first time at the ENOFORUM 2015 in Vicenza, during which the salient points of the project were illustrated, today it is the flagship of the work of R & D of EVER for biotechnologies. All the yeasts in the MYCOFERM range are selected, produced and distributed according to the procedures defined in the Y-TEAM protocol. Evolution from "collection of strains" to "characterized collection"
Collecting yeast strains is not functional if you are not able to know their genetic and physiological characteristics, let alone if their technological attributes are not defined. Characterizing a yeast strain involves its definition, highlighting its characteristics. The characteristics of a yeast strain can be traced back to three different types of knowledge: genetic, physiological, technological. The "work culture" is prepared from the strain stock, which is immediately controlled from the genetic point of view by comparing it with the "reference" strain. If the genetic test is passed, the culture is sent to the production plant, vice versa the preparation of the culture must be repeated. Once arrived at the production plant, the biomass is multiplied, centrifuged, extruded, dried and packaged according to the established "production recipe". Once the product is ready, it is controlled in accordance to all the parameters: genetic, microbiological, qualitative and only after passing all the requirements the lot gets accepted and judged suitable for commercialization. 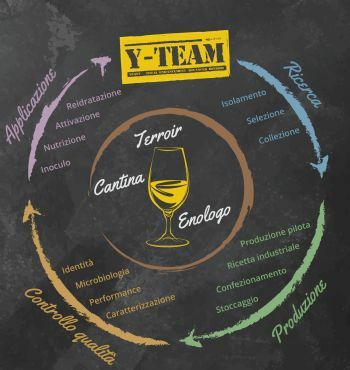 Y-TEAM having done a great job of characterizing of the strains is able to provide assistance to the oenologist both as regards the correct use, recommending the strain or the protocol most suited to obtaining the sought result, but also to intervene by studying specific solutions for the most various problems present at company level, such as: dedicated rehydration protocols, dedicated fermentative / re-fermentative protocols, management of difficult fermentations due to adverse environmental / trophic / substrate conditions. Feedback for the redesign and refinement of finished products. The phases described above have provided two levels of interpretation, on the one hand setting the basis for a quality management system and, on the other, stimulating new approaches for future developments. In particular we are oriented to the characterization of the strains of the collection according to their aptitudes to be used for the production of cellular / molecular fractions to be used in yeast derivatives formulations (auto lysates, yeast peels, inactive yeasts, mannoproteins, etc. ).